This is plate 3 from Robert Melville Grindlay's 'Scenery, Costumes and Architecture chiefly on the Western Side of India'. Grindlay (1786-1877) was only 17 when he arrived in India in 1803. He served with the Bombay Native Infantry from 1804 to 1820 and during this period made a large collection of sketches and drawings. The Siddi Bashir mosque with its 'shaking' minarets is believed to have been built by a slave of Sultan Siddi Bashir in such a way as to be resistant to earthquakes. 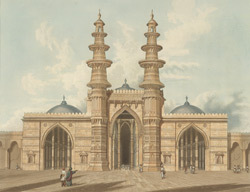 Grindlay wrote of the mosque: "the most remarkable circumstance attached to this building is the vibration which is produced in the minarets, or towers, rising from the centre of the building, by a slight exertion of force at the arch in the upper gallery."